In Part I of our series on Socialism in the Modern World, we looked at the tragic story of Venezuela. Today, we’re going to look at what we can learn from the Nordic nations. And the first thing to understand, as I explain in this interview, is that these nations are only socialist if the definition is watered down. As I noted in the interview, real socialism is based on government ownership and control of the “means of production.” But Nordic countries don’t have government-owned factories, government-controlled allocation of resources, or government regulation of prices. In other words, those nations are not socialist (government ownership), they’re not fascist (government control), and they’re not even corporatist (cronyism). In a column for the Washington Post, Max Boot accurately describes them as free-market welfare states. …rigging elections and locking up or killing political opponents. This is one model of socialism — the same approach that has been applied in Cuba and the Soviet Union. But there are many other varieties that are far more benign. …the Scandinavian model. 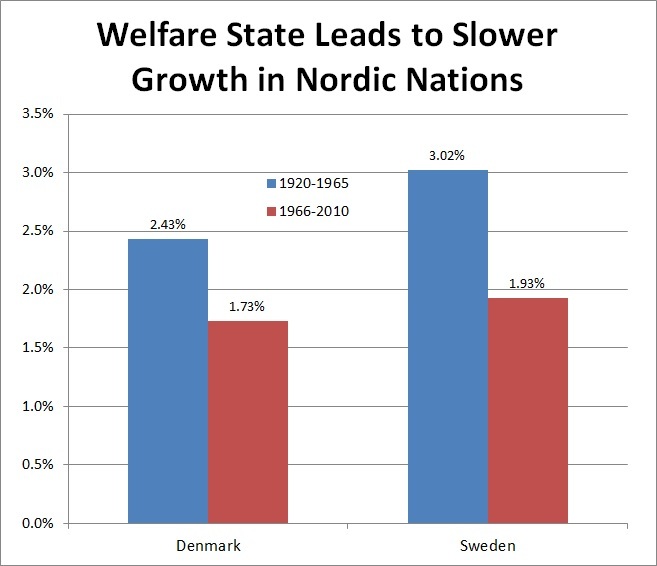 …Denmark, Norway and Sweden…show that a “free-market welfare state” isn’t an oxymoron. …By some measures, moreover, they are freer, economically…than the United States. That last sentence isn’t a typo. The United States has more overall economic freedom than the Nordic nations, but both Denmark and Finland actually rank above America when looking at factors other than fiscal policy. And Sweden and Norway only trail the United States by 0.03 and 0.06 points, respectively. That being said, a big lesson to learn is that fiscal policy is a mess in the Scandinavian countries. …there is nothing sinister about wanting to emulate the Scandinavian example. But that doesn’t necessarily mean it’s practical. The Scandinavians have lower corporate tax rates than the United States but much higher individual taxes. …The Scandinavian countries also charge hefty value-added taxes of 25 percent on consumption. The United States doesn’t have a national sales tax, and the average rate for state sales taxes is only 7 percent. In all, Scandinavians pay $25,488 a head in taxes compared with $14,793 a head in the United States — 72 percent more. This is what it takes to finance a Scandinavian-style social welfare state. It can’t be done simply by raising marginal tax rates on the wealthiest taxpayers to 70 percent, as Ocasio-Cortez suggests, because few taxpayers pay the top rate. It requires a massive tax hike on the middle class. Amen. This is a point I have frequently made, most recently when writing about Alexandria Ocasio-Cortez’s statist agenda. Ordinary taxpayers will pick up most of the tab if the left’s agenda is adopted. But I’m digressing. Let’s return to today’s main issue, which is the Nordic nations and socialism. Technically, there’s no connection. As I said in the interview, those countries have never been socialist. Heck, if those nations are socialist, then so is the United States. There is a lesson to be learned, however, and that lesson is relevant whether one uses the technical or common definition of socialism. Simply stated, the relative success of those nations is due to free markets and a history of small government, but the imposition of big welfare states starting in the 1960s has weakened the region’s economic vitality. This chart tells you everything you need to know. P.S. Actually, there is more your should know. Nima Sanandaji’s data on how Americans of Nordic descent are richer than residents of Nordic nations is very illuminating. P.P.S. And we have specific data from Sweden showing how that nation lost ground after it adopted the big welfare state (and has subsequently gained ground thanks to pro-market reforms such as nationwide school choice and partial pension privatization). I’ve repeatedly expressed skepticism about the idea of governments providing a “basic income” because I fear the work ethic will (further) erode if people automatically receive a substantial chunk of money. Moreover, I also fear that a basic income will lead to an ever-expanding burden of government spending, particularly once net beneficiaries figure out they can vote themselves more money. Given these concerns, I should be happy about this report from the New York Times. For more than a year, Finland has been testing the proposition that the best way to lift economic fortunes may be the simplest: Hand out money without rules or restrictions on how people use it. The experiment with so-called universal basic income has captured global attention… Now, the experiment is ending. The Finnish government has opted not to continue financing it past this year, a reflection of public discomfort with the idea of dispensing government largess free of requirements that its recipients seek work. …the Finnish government’s decision to halt the experiment at the end of 2018 highlights a challenge to basic income’s very conception. Many people in Finland — and in other lands — chafe at the idea of handing out cash without requiring that people work. …Finland’s goals have been modest and pragmatic. The government hoped that basic income would send more people into the job market to revive a weak economy. …The basic income trial, which started at the beginning of 2017 and will continue until the end of this year, has given monthly stipends of 560 euros ($685) to a random sample of 2,000 unemployed people aged 25 to 58. Recipients have been free to do as they wished… The Finnish government was keen to see what people would do under such circumstances. The data is expected to be released next year, giving academics a chance to analyze what has come of the experiment. The reason I’m conflicted is that the current welfare state – both in the United States and other developed nations – is bad for both taxpayers and poor people. So I like the idea of experimentation. There has to be a better way of alleviating genuine suffering without trapping poor people in dependency or punishing taxpayers. Indeed, one of my arguments for radical decentralization in America is that states will try different approaches and we’ll have a much better chance of learning what works and what doesn’t. And maybe we’ll learn that there are some benefits of providing a basic income. But, as reported by the U.K.-based Guardian, it’s unclear whether the Finnish experiment lasted long enough or was comprehensive enough to teach us anything. I will be interested to see whether researchers generate any conclusions when they look at the two years of data from the Finnish experiment. That being said, there already has been some research that underscores my concerns. The OECD is not my favorite international bureaucracy, but its recent survey on Finland included some sobering estimates on the cost of a nationwide basic income. In a basic income scenario, a lump-sum benefit replaces a number of existing benefits, financed by increasing income taxation by nearly 30% or around 4% of GDP. …the basic income requires significant increases to income taxation. …Financing a basic income at a meaningful level thus would require considerable additional tax revenue, and heavier taxation of income would at least partially undo any improvement in work incentives. And in a report on basic income last year, the OECD poured more cold water on the idea. …large tax-revenue changes are needed to finance a BI at meaningful levels, and tax reforms would therefore need to be an integral part of budget-neutral BI proposals. …abolishing tax-free allowances and making BI taxable means that everybody would pay income tax on the BI, and on all their other income. Tax burdens would go up for most people as a result, further increasing tax-to-GDP ratios that are currently already at a record-high in the OECD area. …There are also major concerns about unintended consequences of a BI. An especially prominent one is that unconditional income support would reduce the necessity for paid work. Indeed, it’s difficult to see how work incentives aren’t adversely affected. Why go through the hassle of being employed when you can sit at home and play computer games all day? P.S. Given the option of voting on a basic income in 2016, Swiss voters overwhelmingly rejected the notion. P.P.S. Former Vice President Joe Biden actually agrees with me about one of the downsides of basic income. The world’s best welfare state arguably is Finland. Yes, the burden of government spending is enormous and the tax system is stifling, but the nation gets extremely high scores for rule of law and human liberty. Moreover, it is one of the world’s most laissez-faire economies when looking at areas other than fiscal policy. Indeed, depending on who is doing the measuring, Finland ranks either slightly above or slightly below the United States when grading overall policy. Yet even the best welfare state faces a grim future because of demographic change. Simply stated, redistribution programs only work if there is a sufficiently large supply of new taxpayers to finance promised handouts. And that supply is running dry in Finland. Bloomberg reports that policymakers in that nation are waking up to the fact that there won’t be enough future taxpayers to finance the country’s extravagant welfare state. Demographics are a concern across the developed world, of course. But they are particularly problematic for countries with a generous welfare state, since they endanger its long-term survival. 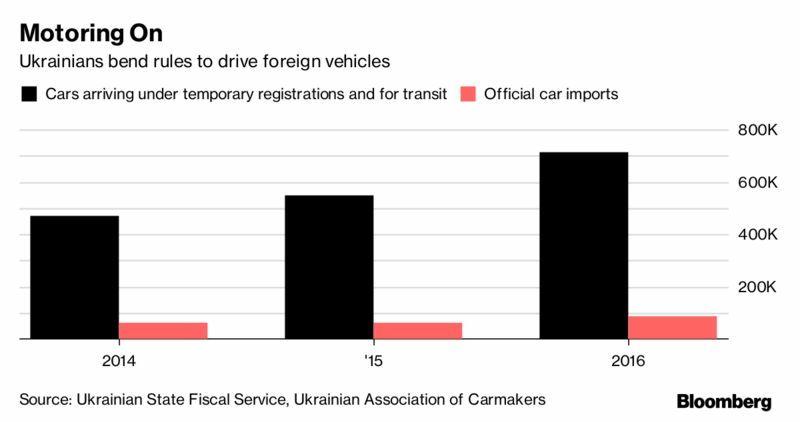 …the Aktia Bank chief economist said in a telephone interview in Helsinki. 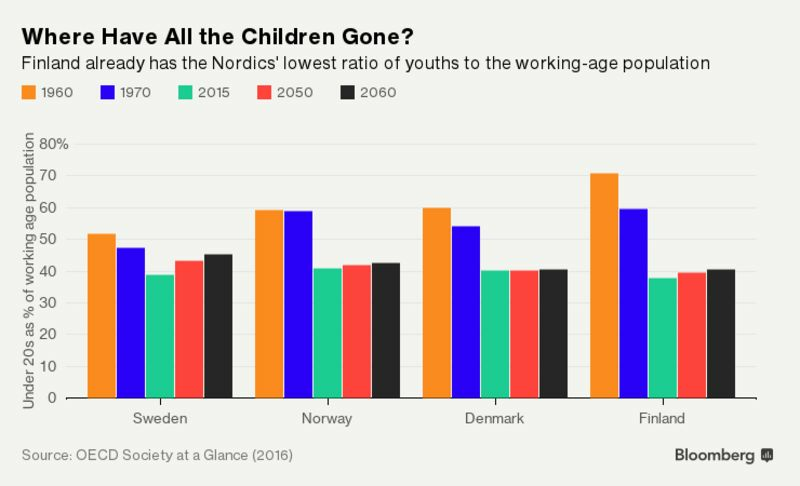 “We have a large public sector and the system needs taxpayers in the future.” …According to the OECD, Finland already has the lowest ratio of youths to the working-age population in the Nordics. …And it also has the highest rate of old-age dependency in the region. …The situation is only likely to get worse, according to OECD projections. 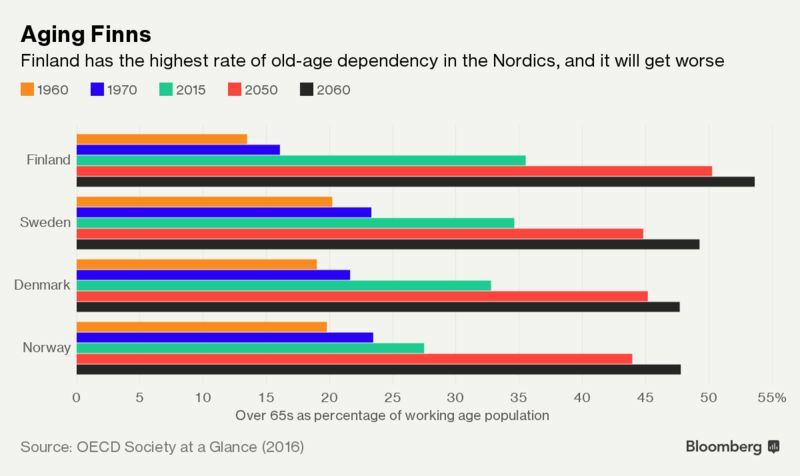 Here are a couple of charts showing dramatic demographic changes in Nordic nations. The first chart shows the ratio of children to working-age adults. And the second charts shows the population of old people (i.e., those most likely to receive money from the government) compared to the number of working-age adults. As you can see, the numbers are grim now (green bar) but will get far worse by the middle of the century (the red and black bars) because the small number of children today translates into a small number of working-age adults in the future. To be blunt, these numbers suggest that it’s just a matter of time before the fiscal crisis in Southern Europe spreads to Scandinavia. Heck, it’s going to spread everywhere: Western Europe, Eastern Europe, Asia, the developing world, Japan and the United States. Though it’s important to understand that demographic changes don’t necessarily trigger fiscal and economic problems. Hong Kong and Singapore have extremely low fertility rates, yet they don’t face big problems since they are not burdened by western-style welfare states. By the way, the article also reveals that Finland’s government isn’t very effective at boosting birthrates, something that we already knew based on the failure of pro-natalist government schemes in nations such as Italy, Spain, Denmark, and Japan. Though I’m amused that the reporter apparently thinks government handouts are a pro-parent policy and believes that more of the same will somehow have a positive effect. Finland, a first-rate place in which to be a mother, has registered the lowest number of newborns in nearly 150 years. …the fertility rate should equal two per woman, Schauman says. It was projected at 1.57 in 2016, according to Statistics Finland. That’s a surprisingly low level, given the efforts made by the state to support parenthood. …Finland’s famous baby-boxes. Introduced in 1937, containers full of baby clothes and care products are delivered to expectant mothers, with the cardboard boxes doubling up as a makeshift cot. …Offering generous parental leave…doesn’t seem to be working either. …The government has been working with employers and trade unions to boost gender equality by making parental leave more flexible and the benefits system simpler. Sigh, a bit of research would have shown that welfare states actually have a negative impact on fertility. The bottom line is that entitlement reform is the only plausible way for Finland to solve this major economic threat. P.S. Since the nation’s central bank has published research on the negative impact of excessive government spending, there are some Finns who understand what should be done. The notion that government should automatically give everyone money – a policy known as “universal basic income” – is now getting a lot of attention. From an economic perspective, I acknowledge that the idea should not be summarily rejected. Here’s some of what I wrote earlier this year. …there actually is a reasonable argument that the current welfare state is so dysfunctional that it would be better to simply give everyone a check instead. But I’m nonetheless very skeptical. Simply stated, the math doesn’t work, people would have less incentive to work, and there would be “public choice” pressures to expand the size of the checks. So when the topic came up as part of a recent interview, I criticized the proposal and praised Swiss voters for rejecting – by an overwhelming margin – a referendum that would have created a basic income in that nation. My reaction was probably even more hostile than normal because I don’t like it when guilt-ridden rich people try to atone for their wealth by giving away my money. Moreover, it’s silly for Zuckerberg to use Alaska as an example because of its oil wealth and small population. That being said, if I had more time, I would have been more nuanced and pointed out that we hopefully will learn more from some of the experiments that are happening around the world. Especially what’s happening on the other side of the north pole from Alaska. The New York Times published an in-depth preview of Finland’s experiment late last year. Here’s a description of the problem that Finnish policymakers want to solve. …this city has…thousands of skilled engineers in need of work. Many were laid off by Nokia… While entrepreneurs are eager to put these people to work, the rules of Finland’s generous social safety net effectively discourage this. Jobless people generally cannot earn additional income while collecting unemployment benefits or they risk losing that assistance. For laid-off workers from Nokia, simply collecting a guaranteed unemployment check often presents a better financial proposition than taking a leap with a start-up. For anyone who has studied the impact of redistribution programs on incentives to work, this hardly comes as a surprise. Indeed, the story has both data and anecdotes to illustrate how the Finnish welfare state is subsidizing idleness. In the five years after suffering a job loss, a Finnish family of four that is eligible for housing assistance receives average benefits equal to 73 percent of previous wages, according to data from the Organization for Economic Cooperation and Development. That is nearly triple the level in the United States. …the social safety net…appears to be impeding the reinvigoration of the economy by discouraging unemployed people from working part time. …Mr. Saloranta has his eyes on a former Nokia employee who is masterly at developing prototypes. He only needs him part time. He could pay 2,000 euros a month (about $2,090). Yet this potential hire is bringing home more than that via his unemployment benefits. “It’s more profitable for him to just wait at home for some ideal job,” Mr. Saloranta complains. So the Finnish government wants to see if a basic income can solve this problem. …the Finnish government is exploring how to change that calculus, initiating an experiment in a form of social welfare: universal basic income. Early next year, the government plans to randomly select roughly 2,000 unemployed people — from white-collar coders to blue-collar construction workers. It will give them benefits automatically, absent bureaucratic hassle and minus penalties for amassing extra income. The government is eager to see what happens next. Will more people pursue jobs or start businesses? How many will stop working and squander their money on vodka? Will those liberated from the time-sucking entanglements of the unemployment system use their freedom to gain education, setting themselves up for promising new careers? …The answers — to be determined over a two-year trial — could shape social welfare policy far beyond Nordic terrain. The results from this experiment will help answer some big questions. …basic income confronts fundamental disagreements about human reality. If people are released from fears that — absent work — they risk finding themselves sleeping outdoors, will they devolve into freeloaders? “Some people think basic income will solve every problem under the sun, and some people think it’s from the hand of Satan and will destroy our work ethic,” says Olli Kangas, who oversees research at Kela, a Finnish government agency that administers many social welfare programs. “I’m hoping we can create some knowledge on this issue.” …Finland’s concerns are pragmatic. The government has no interest in freeing wage earners to write poetry. It is eager to generate more jobs. As I noted above, this New York Times report was from late last year. It was a preview of Finland’s experiment. People have been getting checks for several months. Are there any preliminary indications of the impact? Well, the good news is that recipients apparently like getting free money. Here are some excerpts from a report by Business Insider. …some of the 2,000 recipients are already reporting lower levels of stress. The $600 they receive each month might not be much, but it’s enough to put some people’s anxiety at ease. But the bad news is that the handouts are giving people the flexibility to reject work. Marjukka Turunen, head of Kela’s legal benefits unit, told Kera News. “There was this one woman who said: ‘I was afraid every time the phone would ring, that unemployment services are calling to offer me a job,'”… Scott Santens, a basic income advocate and writer…says basic income redistributes power into the middle-class — namely, to turn down unappealing jobs. The last sentence of the excerpt is particularly worrisome. Some advocates think universal handouts are good precisely because people can work less. It’s obviously too early to draw sweeping conclusions, especially based on a couple of anecdotes. However, a recent column in the New York Times by two left-leaning Finns suggests that the data will not be favorable to universal handouts. The authors start with a basic explanation of the issue. Universal basic income is generating considerable interest these days, from Bernie Sanders, who says he is “absolutely sympathetic” to the idea, to Mark Zuckerberg, Facebook’s chief executive, and other tech billionaires. The basic idea behind it is that handing out unconditional cash to all citizens, employed or not, would help reduce poverty and inequality… As a rich country in the European Union, with one of the highest rates of social spending in the world, Finland seemed like an ideal testing ground for a state-of-the-art social welfare experiment. …Kela, the national social-insurance institute, randomly selected 2,000 Finns between 25 and 58 years of age who were already getting some form of unemployment benefits. The subsidies were offered to people who had been unemployed for about one year or more, or who had less than six months of work experience. But then they denigrate the study. …the Finnish trial was poorly designed… The trial size was cut to one-fifth of what had originally been proposed, and is now too small to be scientifically viable. Instead of giving free money to everyone, the experiment is handing out, in effect, a form of unconditional unemployment benefits. In other words, there is nothing universal about this version of universal basic income. …The government has made no secret of the fact that its universal basic income experiment isn’t about liberating the poor or fighting inequality. Instead, the trial’s “primary goal” is “promoting employment,” the government explained in a 2016 document proposing the project to Parliament. Meaning: The project was always meant to incentivize people to accept low-paying and low-productivity jobs. Maybe I’m reading between the lines, but it sounds like they are worried that the results ultimately will show that a basic income discourages labor supply. Which reinforces my concerns about the entire concept. Yes, the current system is bad for both poor people and taxpayers. But why would anyone think that we’ll get better results if we give generous handouts to everyone? We already know that unemployment benefits discourage people from working. We already know that food stamps discourage people from working. We already know that Obamacare discourages people from working. We already know that disability payments discourage people from working. So if we replace all those handouts with one big universal handout, is there any reason to expect that somehow people will be more likely to find jobs and contribute to the economy? Again, we need to wait another year or two before we have comprehensive data from Finland. But I’m skeptical that we’ll get a favorable outcome. P.S. The Wizard-of-Id parody shown above contains a lot of insight about labor supply and incentives. As does this Chuck Asay cartoon and this Robert Gorrell cartoon. P.P.S. 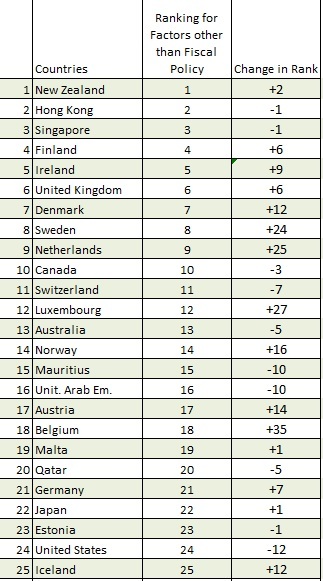 Since I rarely write about Finland, I should point out that it is ranked #20 for economic liberty, only four spots behind the United States (and the country is more pro-market than America when looking at non-fiscal policy factors). P.P.P.S. On the minus side, Finland has decided that broadband access is somehow a human right. On the plus side, the country’s central bank produces good research on the burden of government spending, and its former president understood the essential flaw of Keynesian economics. Forget the Magna Carta and the Constitution. Finland is now on the cutting edge of protecting, promoting, and guaranteeing fundamental rights. As the BBC story excerpted below reports, Finland has announced that broadband access is now a legal right! Yes, you’re reading it here first. But not just the right to broadband. Apparently one megabit per second is a human right today and 100 megabits per second is a human right by 2015. I gather this is the Finnish version of a “living, breathing” right. My only question, though, is whether older Finns can sue the government for failing to provide this right back in the awful, deprived days before Al Gore invented the Internet? From 1 July every Finn will have the right to access to a 1Mbps (megabit per second) broadband connection. Finland has vowed to connect everyone to a 100Mbps connection by 2015. In the UK the government has promised a minimum connection of at least 2Mbps to all homes by 2012 but has stopped short of enshrining this as a right in law. The Finnish deal means that from 1 July all telecommunications companies will be obliged to provide all residents with broadband lines that can run at a minimum 1Mbps speed.